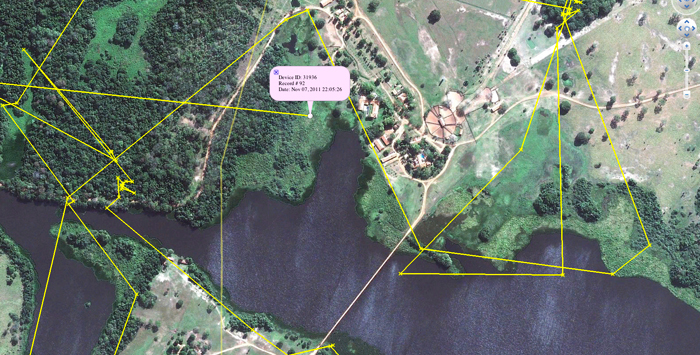 Last month we brought you a story about the Caiman Ecological Refuge situated in the Southern Pantanal, South America. This ecotourism destination, much like Londolozi, is home to many spotted cats and where we have abundant Leopard, they have the Jaguar. 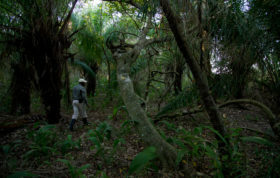 The Caiman Ecological Refuge is currently undertaking the Restoration of certain areas of the Pantanal in order to create a balance between wildlife and cattle ranching and the team there have embarked on a jaguar habituation programme with a vision to soon be able to offer jaguar viewing to guests at Caiman, similar to which has been achieved with Leopards at Londolozi. 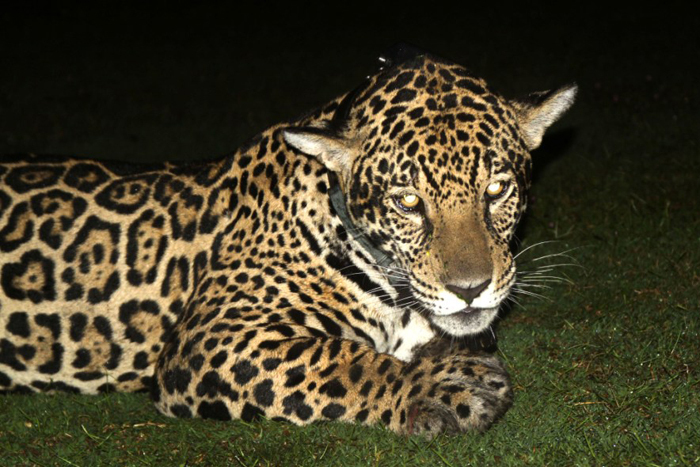 The below post is an interesting report from the environmental manager, Helder Brando, detailing how they are collaring Jaguars to be able to monitor their movements and gain a better understanding of their behaviour. 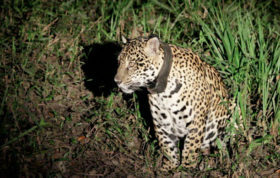 Not only does this information aid in better understanding the cat, but it also allows for the Jaguars to be tracked, found and thus habituated with greater ease. 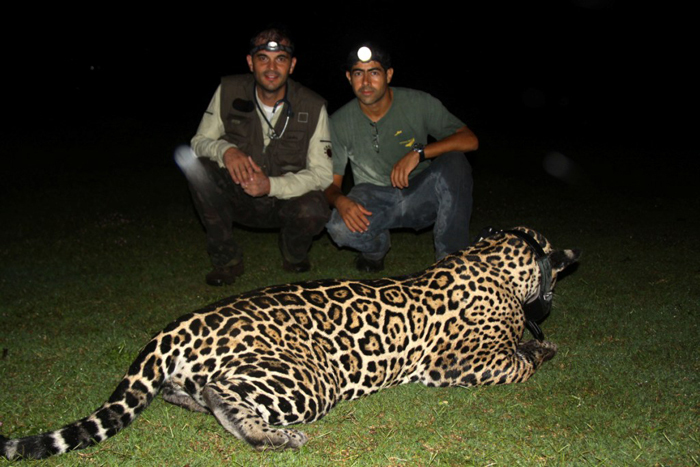 ‘At two o’clock in the morning the Onçafari Project team was preparing itself for the first jaguar capture. We were running through the forest edge towards the expected location and when we went out of the car we could see a beautiful female in the trap. As expected, she was calm and we did all the preparations for the sedative. The photo below shows the dart already fired. She was so quiet with our presence that she didn’t even respond to the dart firing. At the horizon a powerful storm was approaching and as we were working, the sounds of thunders and the cold wind built the scenery. It was an unique experience to work with the Americas’ largest wildcat surrounded by the sounds of the Pantanal rain. 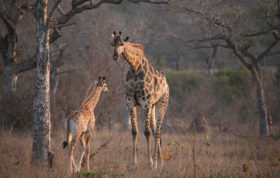 It was a beautiful female weighting 85 kg and about 5 years old. The whole process of setting the GPS collar was done quickly and in less than two hours she was recovering herself already. Her coat was wonderful without any apparent marks, a healthy young adult. The storm was gone weak and was now a gentle rain. She recovered quickly on the wet grass and her name couldn’t be more appropriate: CHUVA, meaning “Rain” in portuguese. Two days later, another pleasant surprise awaited us. It was about eight o’clock in the morning. 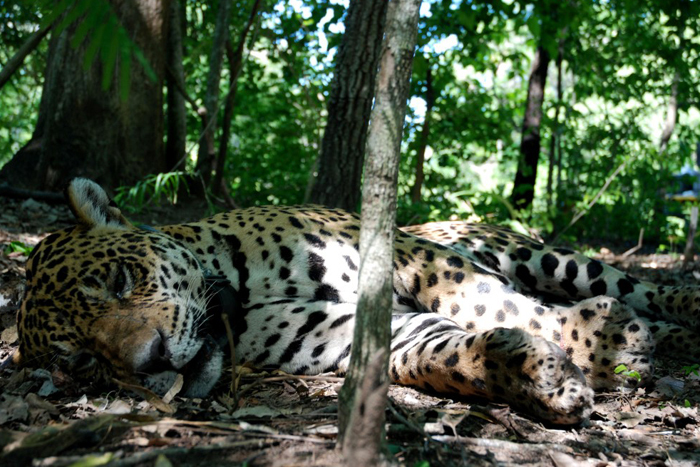 We knew that four jaguars were using that area, when a soft sunlight showed a beautiful jaguar resting on the track. Even though it was attached to the trap, the jaguar was sleeping when we arrived. Its honey-colored eyes showed a calm and confident expression. 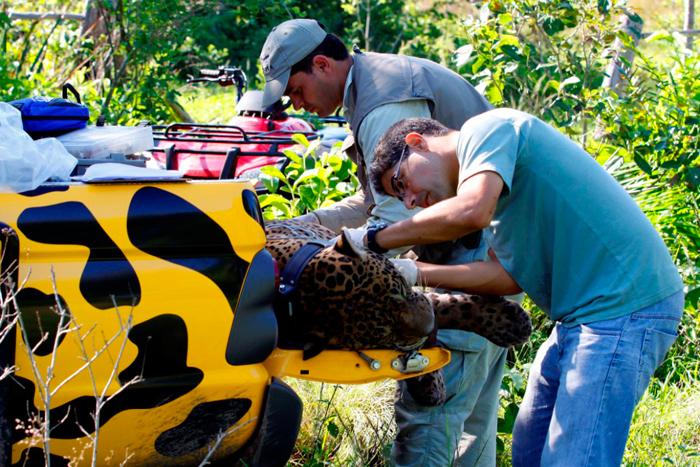 In five minutes, the jaguar was already lying down and in a few seconds would be totally sedated. It was a soft yellow coloured male with very dark spots and rosettes. Working during the day was very special and eventhough we were quite concentrated we could appreciate all the experience and all the details of this big cat. It was a spectacular morning. Being close to this undenger animal is a unique opportunity for those working in conservation and ecotourism. This was a big jaguar male, with powerful muscles, huge paws and prominently large jaw and at the same time showing a smooth behavior. Working with an animal so relaxed made the whole procedure easy to the veterinarian Joares May and the biologist Helder Brandão. 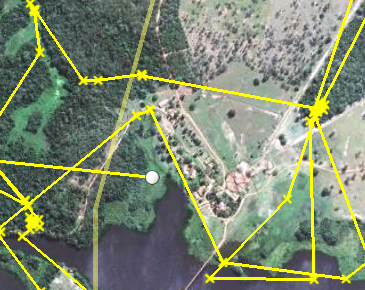 Setting the GPS collar, the biometric measurements, the biological sampling, collecting ticks and the monitoring of the vital signs were done quickly. All the work was done on the back of the Onçafari Project vehicle and soon after the animal was placed in a hammock forest to recover itself. 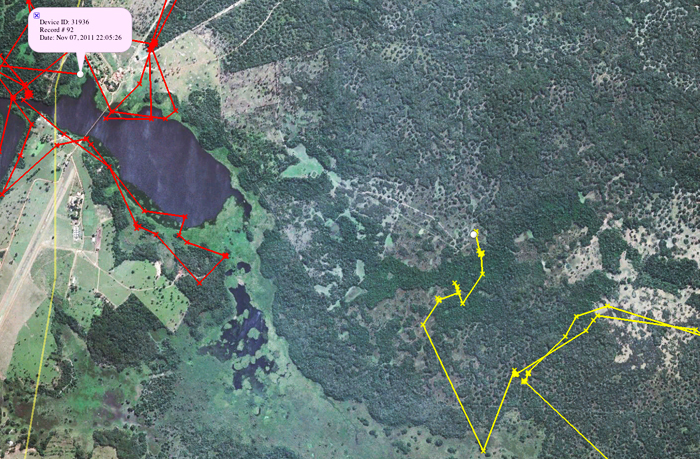 At this point the Caiman community had the opportunity to witness this phase of the capture, an important moment for environmental education and awareness of the importance of the jaguar in the ecosystem. This is one of the objectives of the Onçafari Project, stimulated by CENAP: stablish an educational channel of communication among communities, ranchers and researchers. Wow – 110kg of muscle and might – he deserves an imperial sounding name – they really are exquisite animals – all the best to the project team. Brilliant work. Can’t wait to go there. I never realized how big they are. They’re freaking huge! very similar in appearance to leopards……though unlike leopards, the difference between males and females isn’t as marked in jaguars….. 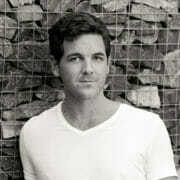 Interesting to note Tony, thanks for posting. Yeah they look a lot like Leopard but they are stockier and have wider heads. Really impressively built animals with an almost bear like appearance. 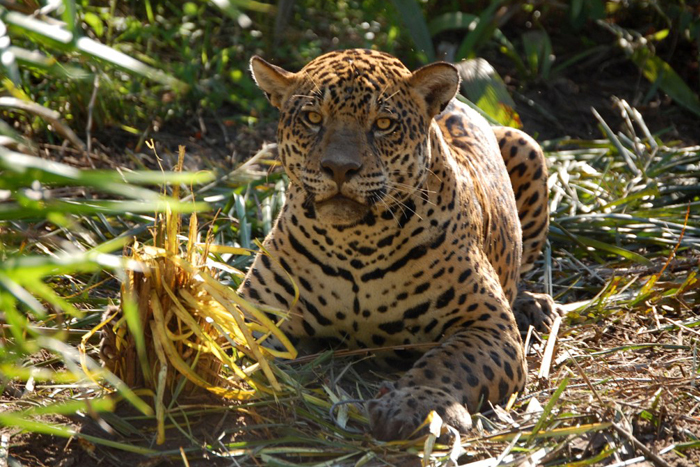 The Jaguars from the Pantanal are very big and powerful!